The owner of Teknogear, Diego Iodice, who was former Systems Engineer in Formula E, with twenty years of experience in Motorsport, has revolutionized the Road Races more than ten years ago, planning and building the first electronic actuation system of sequential gearbox. The idea, born to meet the needs of drivers in having even greater cornering performance, without leaving the hands from the steering wheel, took place with one of the first electronic gearbox realized for the Champion Simone Faggioli, driving Osella Sport Prototype in European Hillclimb Championship. 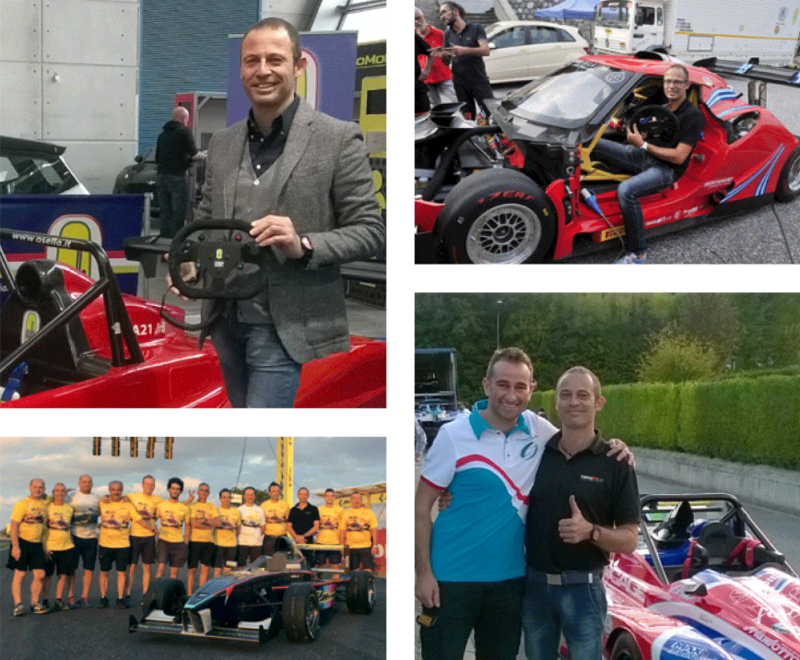 Iodice training course accrued in several categories, from F3 to F3000, also attending the GT Races from the last nineties to today. Living every day within Motorsport led Iodice to the specialization oriented to the implementation of electronic gearbox, up to reach the prominent role as Systems Engineer in the World Electric Formula 1. The extreme speed of the shift system, both in acceleration and downshift, and the reliability demonstrate the high popularity of our kit in Road Races during the last decade. The electronic shift system can be applied on every type of car and any sequential gearbox, also motorcycle derived. The system is also fitted for gearbox of different brands as Hewland, Xtrac, Sadev, Hollinger, Quaife, and its installation requires from 1 to 2 working days. 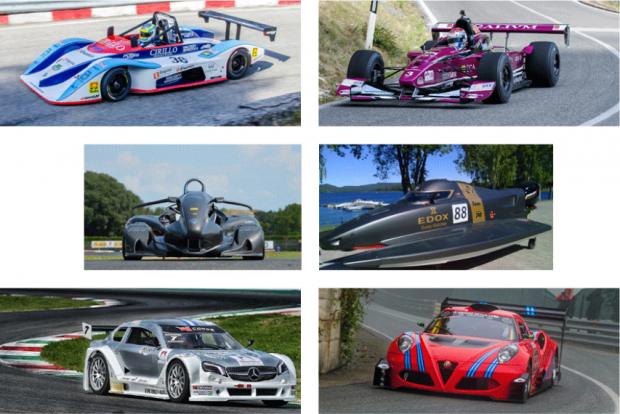 The cars with have already installed our systems are Tourism and Grand Tourism, as Ferrari 550 Maranello, Porsche 911, GT3 and GT4 version, Renault Clio Cup, Ford Focus WRC, Sport Prototypes, F3 cars, Formula Renault, Formula Abarth and Formula 3000, Elia’s Barchetta, Formula Gloria and Radical and many others. The possible applications, however, are not limited to cars. Diego Iodice has, in fact, already successfully installed its technology on other motor format of different categories, from Go-Karts to Off-Road up to the powerful Offshore. The Teknogear paddle shift system is a complete implementation system for sequential gearbox and it is fully electronic. The actuators are high power and ensure high torque, together with a linear high speed. They also allow repetitions of movements in close sequence, always identical, which is a key feature, especially in the downshift. The air systems are not able to achieve similar performance, because they rely on an elastic element linked to various problems such as the pressure, which can sometimes be insufficient, or to continuous maintenances of the air circuit in pressure. The systems we realize are characterized by immediate response to the driver demand: we have only 2 milliseconds of response delay and executions of shift system both in shifting and downshift are far inferior to a manual shift system. It goes from 80ms average of a manual shift system to an implementation time of 30ms average easily. Dynamic strategies ensure maximum performance, always using the lowest times of cut off, both for the external conditions, and for the gearbox used. The shifting is done without clutch, the synchronism between the two system actuators (the throttle actuator and the gearbox one) allows repetitions of close movement with 5 down shifts sequences within less than a second. The gearbox control unit which we realize is the product of 10 years of experience . Microprocessors used are of a 32bit architecture, with working frequencies above 100Mhz. The hardware and the software, with advanced strategies, allow a complete control of the gearbox. The two hardware channels dedicated to the cut off, the two map switches that the driver can use in real time, the different time of cut off, the blip configurable for the single gearbox and advanced strategies, including the dynamic cut off that works with a strategy based on the use of closed loop on barrel, allow us to have the shortest time of shift system and the security that the movements respect the mechanical part, avoiding damages of the same gearbox. The shifting cut-off times are verified by the GCU and allow the system to adapt to changes of external conditions (rain, dry, grip, various differentials, bump, etc). The strategies are complemented by features such as assisted shift system, the engine rpm protection during the downshifting, the control of the slip, the traction controls; we have a dedicated program to the neutral and a configuration of recovery mode in order to allow the gearbox operation in any condition. The possibility of intervention in the calibration of the software and programming by the no-laptop user allow the use of the system in any situation with simplicity. 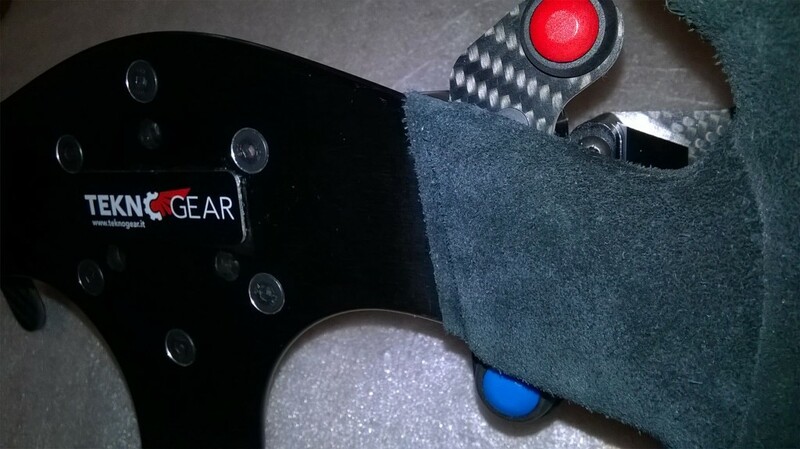 The paddles are made of two different versions: GT and Formula; in both versions they have carbon plates and paddles; they are adaptable to all the steering wheels, from 250mm to 330 mm, be they flat, half a cup or cup, formula or prototype; they have various configurations and can be adjusted in diameter, in distance of paddles, in levers movement, in hardness and intervention points of microswitch. All to fit perfectly, in the most natural way, to each driving position. The micro and the electronic buttons we use are high quality, with more than 100,000 cycles guaranteed by the manufacturer and corresponding to the stringent IP69 standards for water resistance. 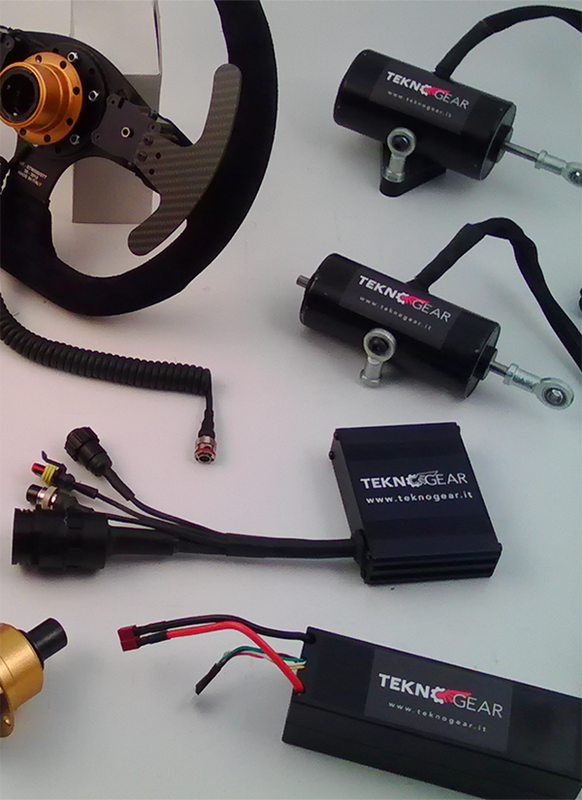 Both the gearbox actuator and the Throttle are electronic and they are entirely designed and manufactured by Teknogear. They are the result of nearly 10 years of experience in implementing gearbox; they reached a very high level of performance and reliability, they are individually tested after production and their level of quality has checked, not by theoretical simulations, but by intense daily racing use of our customers. We have mounted systems for ten years which, even in endurance races, have accumulated over 100,000 km without any problems. The actuators are IP68 as index of impermeability and they are resistant to more than 120 degrees of temperature. We realize our actuators in various size, dedicated to Sadev, Hewland, Hollinger, Quaife, Bacci, Xtrac, Zanghellini gearboxes, to motorcycle engines, kart, etc., or designed to specific customer requirements. 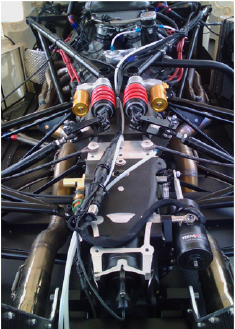 The wiring are made with materials resistant to the temperatures, to friction, oils and fuels. Sheaths are Raychem DR25 and wires are in silver with MIL specifications. All the connections are dedicated to automotive with IP69 impermeability level.